We try out a lot of new games around here and while a lot can be misses, or just “meh”, sometimes we have a big hit. The latest in the “big hit” category is Ya Blew It! 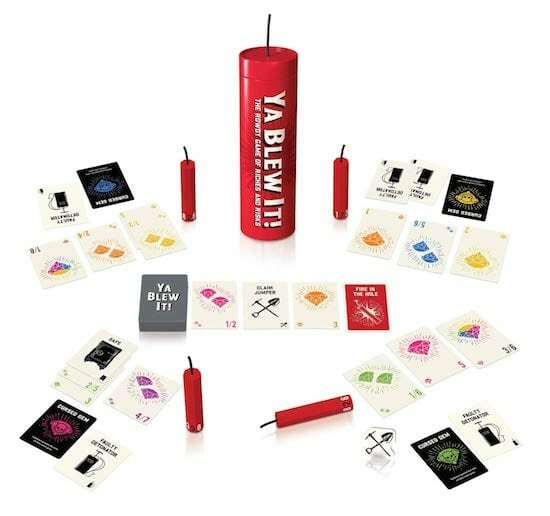 Ya Blew It is a game filled with both strategy and luck that lets you play the roll of an old-timey prospector trying to strike it big. 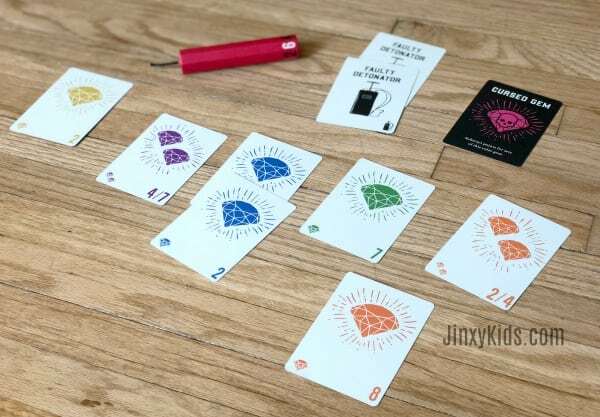 The basics of playing Ya Blew It are somewhat straightforward. You use a deck of cards packed with gems you want to find in your claim, but you need to be careful because the other prospectors will be trying to steal your claim if they get the chance. The dynamite-shaped dice add to the fun and to the element of chance – – – and suspense! A risk-taking game filled with exciting choices and explosive moments! Social play has all players engaged from start to finish. You can roll on every turn! 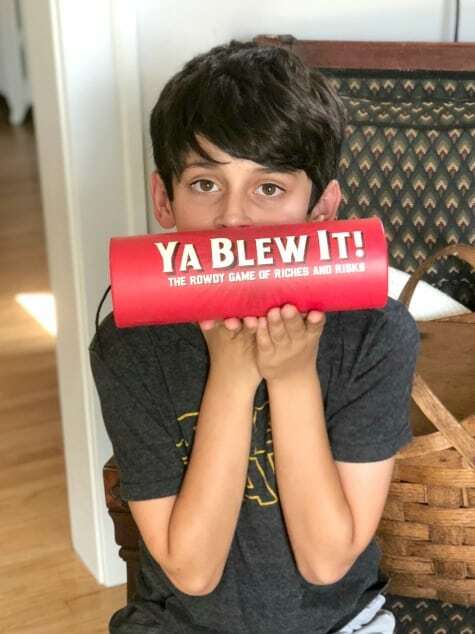 Ya Blew It is designed for players ages 8 and up (our 10-year-old loved it, as did the adults) and is for 3 – 8 players. Reader Giveaway: One lucky Jinxy Kids reader will win their own Ya Blew It game. To enter, just complete the entry form below by 11:59pm ET on 10/9/18. Good luck! I will play with my nieces and nephew. “Let us know why you think the game look fun or who will be playing Ya Blew It if you win.” This does look *rowdy*! People will go *cuh-razy*! Ya Blew It looks fun and my nephew would love playing this. I will be playing with my family, including grandkids. It looks like a fun game. i would be playing with my granddaughter and hubby if I’m the lucky winner. I will play with my children! Looks like fun! I will be playing Ya Blew It my daughter if I win. Thanks for the giveaway! I will play the game with my sister and brother. I would play this game with my kids. I’d play with my cousin! I’d be playing with my daughter and maybe granddaughter. This game looks really exciting! I would love to play it with my son and younger sisters. My children and myself would be playing Ya Blew It . It looks like a fun interesting game. I will play at our monthly family dinner. All I have to say to my grandkids is who wants to blow up a game? I know my grandkids would want to play with me! I will play with my mom and grandma, and maybe my sister. Looks like a fun game to play with my kids. My family loves games. We’d play this together. Looks fun. The game looks awesome and I will play it with my kids and wife. Looks really fun. Would play with my sons. The perfect prize for some fun times with the grandkids. Lots of smiles and laughter will be filling the house as we all play together. Thanks for this chance to win! I’d love to play with my three kids. I love the dynamite dice how cute! I also love the prospector theme my niece and nephew would love to play! This looks like a lot of fun. I would definitely be playing this with my mom and niece. It looks silly. My kids love silly games. I would probably play it with my kids and husband! This would be a fun game for my son, daughter, and me to play. I work with children- this would be fun…. We have a lot of family game nights and I think we would all have fun playing this one! Looks like an interesting game. It would be played with the family, daughter, son and grandkids. Game night fun. This looks like a lively game that I would love playing with my kids! I would add this game to our family game night. Me and my hubby love both card and dice games and this one looks great! Thanks and God bless! I would love this for game night with my husband and daughter! I will be playing with my grandchildren. They love learning new games. This would be great for my daughter and her friends. She likes to have a game night at least once a month. This looks like a fun addition. This looks like a fun game! I would play it with my daughter! I will be playing the game with my grandchild. I would play this game with both my son and daughter. It looks like a fun game! I would play this with both of my kids. my newphws wold love this. I will be playing with my granddaughter and family. My 12-year old daughter loves board/family games. I would be playing with her and my 10 year old son. I would love to try it. I’m used to old classics, so this would be a nice change of pace.